By Idil Hersi, M.D., Valeria Potigailo, M.D. A 33-year-old woman with no known medical history presented with keratoconjunctivitis. Her primary care provider ordered an MRI examination of the orbits (Figure 1). The differential diagnosis for an infiltrative orbital mass depends in large part on patient age, presence or absence of pain, history of systemic disease, known underlying primary neoplasm, and involved orbital structures. The primary diagnostic considerations for an infiltrative orbital mass in an adult woman include orbital pseudotumor, lymphoma, sarcoidosis, and metastatic disease. As these processes may have overlapping imaging appearances, clinical history is of utmost importance in rendering an appropriate list of differential diagnoses. Orbital pseudotumor is an idiopathic orbital inflammatory process that typically presents clinically with an acute onset of pain, swelling, ophthalmoplegia, diplopia and proptosis.1,2 Clinical and imaging findings are unilateral in approximately 75% of cases. Although patients of all ages may be affected, the mean onset of clinical presentation is 50 years of age. 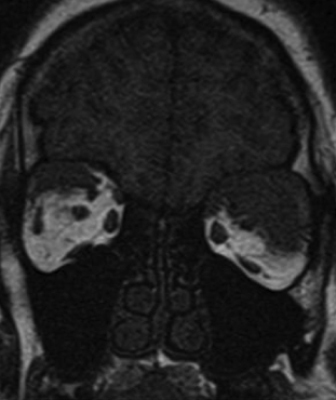 Orbital pseudotumor has a variety of presentations, including localized or diffuse forms that may involve any orbital structure. 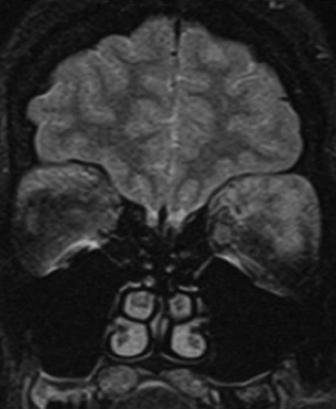 On MRI, orbital pseudotumor is typically iso- to hypointense relative to muscle on T1 sequences, relatively hypointense on T2 sequences, and demonstrates diffuse enhancement.2 It may be classified according to the orbital structures involved, to include myositic, lacrimal, anterior, diffuse and apical subtypes. Of note, the myositic subtype affects both the extraocular muscle belly as well as its myotendinous junction, which helps distinguish orbital pseudotumor from thyroid ophthalmopathy, which typically spares the myotendinous junctions. Patients often respond well to steroid therapy. A number of malignancies are known to metastasize to the orbit, including breast, bronchogenic carcinoma, prostate and melanoma.3 The location within the orbit may be a clue to the primary malignancy. Breast cancer tends to metastasize to fat and muscle, melanoma to muscle, and prostate to bone. Scirrhous breast cancer will cause enophthalmos due to desmoplastic fibrosis.3 A known primary malignancy and other sites of metastatic disease should raise suspicion for metastases to the orbit in the setting of an orbital mass. This case demonstrates the importance of differential diagnosis in the setting of an infiltrating orbital mass. In a young patient without a known history of sarcoidosis or primary malignancy, orbital pseudotumor and lymphoma become primary differential considerations. Both entities have protean manifestations and may involve any orbital structure. A useful differentiating feature is the presence of pain: Orbital pseudotumor is typically painful, while lymphoma is typically painless. Given the history of keratoconjuctivitis and rapid response to steroid therapy, the diagnosis of diffuse orbital pseudotumor was established. Otherwise, a tissue biopsy would have been required. Power AH, Hallet, JW. Carotid body tumors. In: S1. Patnana M, Sevrukov AB, Elsayes KM, et al. 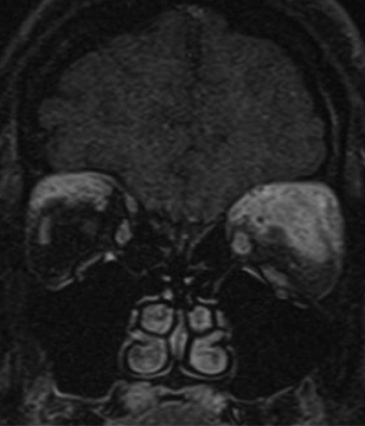 Inflammatory pseudotumor: the great mimicker. Am Journal Roentgenol 2012;198:W217-W227. Narla LD, Newman B, Spottswood SS, et al. Inflammatory pseudotumor. RadioGraphics 2003;23:719-729. Tailor TD, Gupta D, Dalley RW, et al. Orbital neoplasms in adults: clinical, radiologic, and pathologic review. RadioGraphics 2013;33:1739-1758. Priego G, Majos C, Climent F et al. Orbital lymphoma: imaging features and differential diagnosis. Insights Imaging 2012;3:337-344. Mafee MF, Dorodi S, Pai E. Sarcoidosis of the eye, orbit and central nervous system. Role of MR imaging. Radiol Clin North Am 1999;37(1)73-87. Infiltrative Orbital Mass. J Am Osteopath Coll Radiol. Idil Hersi, M.D., Valeria Potigailo, M.D.